The First CBRN Certified Respirator!
" When the Line Must Be Crossed..." First Responders are the ones who must cross the line into danger. Their respiratory equipment must be ready and reliable to protect them against potentially lethal airborne threats. With nearly a century of history and success behind it, MSA stands ready to protect Americans – this time against all potential airborne contaminants that could be unleashed by terrorists across our homeland. 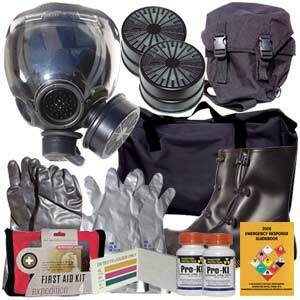 The Millennium CBRN gas mask is the most up-to-date example of MSA's commitment and unwavering dedication to protect today's and tomorrow's First Responder. 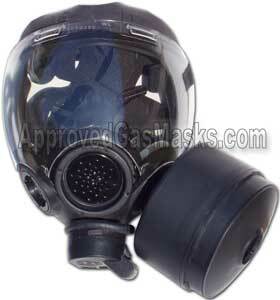 MSA Millennium CBRN gas mask meets or exceeds all performance requirements of the new NIOSH CBRN Standard (read below) by effectively removing harmful gases, vapors and particulates so that the user can confidently breathe safely. The Millennium CBRN canister contains chemical sorbents and a P100 filter to attract, retain, and neutralize contaminants. The Millennium CBRN design is based on a highly successful military gas mask. The wearer enjoys a wide field of view and great flexibility,making it possible to safely perform any tasks required, including firing weapons if needed. 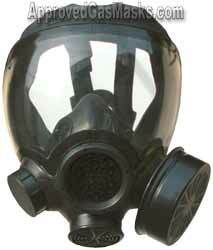 The wearer can communicate easily while wearing the Millennium CBRN Gas Mask, too. 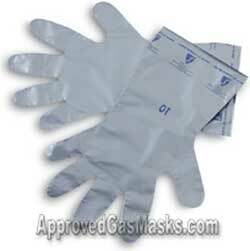 The mask is lightweight and provides a tight seal on the face. 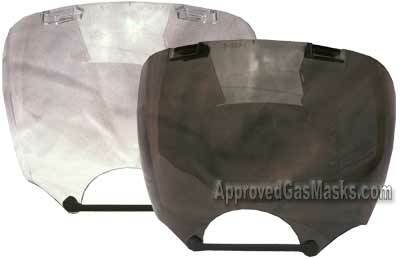 A nose cup is also incorporated for reduced fogging of the facepiece. 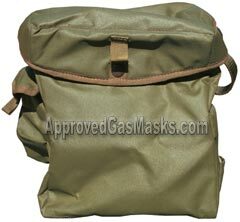 The material is impermeable to chemical agents such as mustard (HD), providing maximum assurance to the wearer. A butyl coated nylon hood also is available for total head protection. Regarding interoperability, the Millennium CBRN Gas Mask is designed as a system and while the thread and gasket are designed to meet the requirements of the standard, only the manufacturer’s assemblies are tested and certified. The mask also permits hydration once the wearer has moved to an uncontaminated area.The CBRN version is the same as a regular Millennium mask (pictured) but with a specific CBRN certified gas filter cartridge. or the hard, removable outsert (outer protective lens), available in clear or tinted. Adds impact & scratch protection! 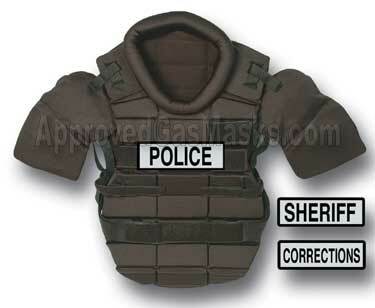 The outsert features a low-profile & is compatable with riot gear. Includes: Mask and clear outsert but no filter. • Chemical, biological, radiological and nuclear agents. • Mask penetration and permeation. • Performance requirements for protection against high concentrations of agents (the shortest period being 15 minutes). • Parameters on environments and applications where masks are to be used, including warm zone environments (locations away from the highest concentrations) and crisis provisions (should terrorists deploy a secondary device as responders arrive at the scene). • Representative degrees of agents,working on the idea that preparing for the worst potential in a family of chemicals would enable protection against the entire family of agents. • Rules for testing service life, particulate efficiency, permeation and penetration, fit factors, field of view and interoperability. • MSA has been an active participant and contributor to the process of determining these new standards and is considered to be a leading expert. 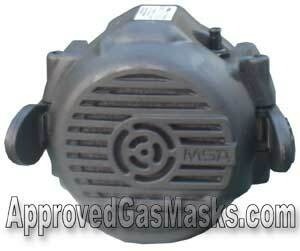 Made by MSA for use only with the Millennium masks. The earpieces on regular eyeglasses break the seal of a gas mask. These frames (lenses not included) are fully contained within the mask. lens, providing additional impact protection. Mask comes standard with a clear. Tinted outsert helps conceal identity (suitable only when sufficient light exists).